HD Ultrasounds Orem: Welcome To Our 3D / 4D Ultrasound Experience! We’d like to thank you for stopping by Kicks & Giggles! We’re very excited to join you on your journey with your new baby, offering the Orem, UT area top-tier HD ultrasounds that use the latest and most detailed technology. 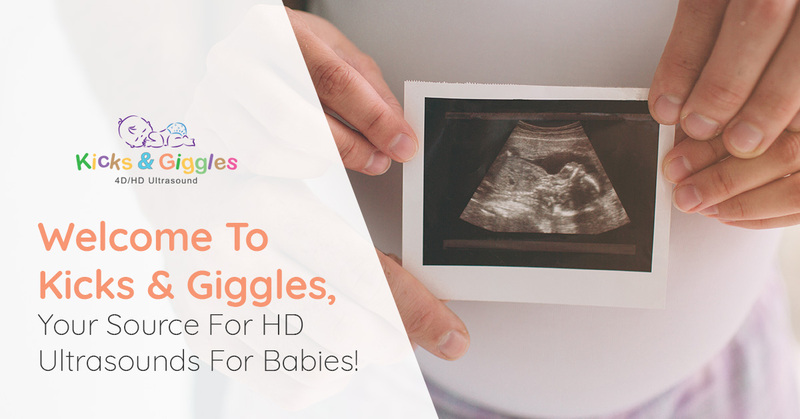 Kicks & Giggles wants to make the lead up to your birth as memorable as possible, and that’s why we have so many wonderful options when you schedule an appointment with us. Let’s take a look! Both 3D and 4D ultrasounds are perfectly safe and offer the same high-definition image quality. These methods are often called HD ultrasounds or HD sonograms. What’s the difference? Well, just like in science class, that extra dimension between 3D and 4D is time. With a 3D sonogram, you’ll get still images of your little one, and the three dimensions will give you a good idea of what they look like. Take a look at our gallery for some sample images we’ve taken. These are the types of images that people have printed out and put on their wall. What’s the best gestational time to get an ultrasound? From 16-25 weeks is an excellent opportunity to see the entirety of the baby, and the facial features are best seen from 25 weeks on. 2D ultrasounds are the ones that most people are familiar with, those black and white images that often show a baby’s profile. 2-dimensional ultrasounds are an excellent low-cost option that can provide some wonderful images of your unborn baby. Some people choose multiple sessions of 2D sonograms instead of a single 3D or 4D sonogram so that they can see their baby grow over time! Some parents are intent on keeping the secret as long as possible, and keeping it is a lot easier when you don’t know! The fact is, finding out which gender your baby is is a surprise no matter when you find out! So you just have to decide whether you want to learn it in a quiet place with your partner or if you’d rather learn when you’re surrounded by hospital staff and are under painkillers. We’re fans of knowing beforehand. Not only do you find out in a much more controlled setting and take in the information as long as you need, but it also just makes planning easier. When you know the gender of your baby earlier, you’ll be able to decorate to your liking and get the right clothing at baby showers. We can help with your baby gender identification in two distinct ways. First is an early gender test that can be done as early as 9-weeks! The mother’s blood is tested for Y-chromosomes, which she wouldn’t usually have unless the baby is a boy. A complete lack of Y-chromosomes means the baby is a girl. The second way we can test is with a gender scan. Because we’re able to view the whole baby, we’ll be able to see what is or isn’t there anatomically. You’ll also be sent home with excellent 2D images of your baby. Images of your baby are incredible, but the heartbeat might be even more so. During your appointment, we can take a recording of your baby’s heartbeat and transfer it to a small device. You’ll then be able to pick a stuffed animal of your choice to put the soundmaker in so that every time you push the animal’s belly you’ll be able to hear the heartbeat. This makes a great gift for a bigger brother or sister, but it’s an even better gift for the mother herself! Learn more about them here. Contact Kicks and Giggles Today! Thanks for letting us be a part of your life and the life of your little one! We hope you’ll contact us when you need an HD ultrasound or any of the wonderful extras that we discussed above. We’ll see you soon at Kicks & Giggles!